Dubai is the leader in the regional design market and has untapped potential and responsibility towards it. The Dubai Design Week brings the chance to initiate a new chapter of design in Dubai. The council has planned for Dubai Design Week in the coming October. Dubai Design Week, a new, city-wide, celebration of design encompassing interior, furniture, product and graphic design, will take place from October 26-31 at Dubai Design District (D3), the city’s design hub announced on Tuesday. The umbrella event will also host a series of talks, exhibitions, special installations and premieres, with a focus on education and global exposure. Of course, it’s about creativity, but as much about hard figures. The global design industry is valued at $2.2 trillion as of 2013, 27 per cent of the Mena region’s design economy was generated by the UAE. Born from a symbiotic relationship between commerce and creativity, design weeks around the world give cultural context and creative impetus to regional creative industries. Dubai Design Week aims for a greater international visibility for our creative class. 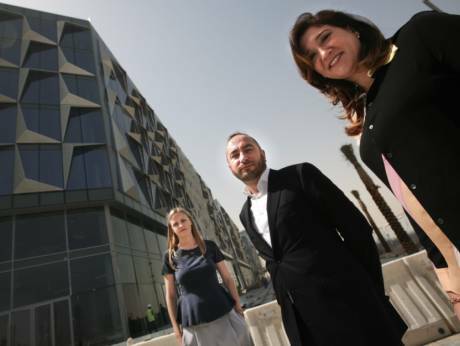 The event is designed to work across three levels: Reciprocal alliance with six leading design weeks will further Dubai’s positioning as a centre for discovery. It will also provide educational opportunities for students and designers in the local design industry. And thirdly, Abwab — a themed collection of design exhibitions inspired by the concept ‘The Element of Play’ — will host exhibits from the GCC in the Kuwaiti, Saudi Arabian and Emirati pavilions, accompanied by exhibits from Jordan, Tunisia and Pakistan. Designers from each country will reinterpret traditional games in pavilions designed by the Emirati architecture firm Loci, situated in the open spaces of Dubai Design District, arranged to be discovered on foot. The world’s largest and most successful design weeks are built around commercial design fairs: 100% Design led to London Design Festival, while Milan Design Week is built around Salone del Mobile. At the heart of the Dubai Design Week is our own commercial design fair, Downtown Design, which moves its home to D3 this year. Fair director Rue Kothari promises a carefully edited mix of international, local, established and emerging brands. With barely any leasable show space left — the fair is still five months away and its footprint doubled from last year’s offering — Downtown Design 2015 will host six design weeks from around the world: Melbourne, Mexico, Helsinki, Istanbul, Beijing and San Francisco, each adding a new layer of never-seen-before content from their territory. In turn, these design weeks will showcase Dubai’s local design talent at their respective events. The Dubai Design week has different aims and motives. It is not only meant for the national market but also for the leadership of the surrounding region of the Middle East. Dubai wants to emerge as the Design Capital and the Dubai Design Week is the first step towards it.